EYAA administers the Eastside Blaze youth football program in cooperation with the Sennah Foundation and Conway Community Center. 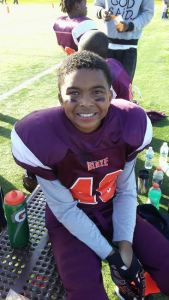 The Eastside Blaze play in the Capital City youth football league, with teams in the 9U, 10U, 11U, 12U and 14U age divisions. Registered tackle football players are provided a helmet, shoulder pads, jersey and padded pants. Our equipment is NOCSAE certified by Riddell and has been inspected, cleaned and serviced. Players are required to provide their own cleats, mouth guard and protective cup. All Eastside Blaze practices are held at Conway Recreation Center, 2090 Conway Ave in St. Paul from 6-8 PM, Monday through Friday throughout the regular season (August to October). Registration begins online starting June 1st. It takes a lot of money and logistical effort to field 5-6 football teams. By registering early, we’re able to take advantage of pre-season equipment credits from manufacturers and plan for the upcoming season. Also, if your child is registered late, it may take longer to order and issue equipment, causing them to miss out on valuable practice time.